A walk through London's older neighbourhoods provides fans of Victorian buildings with some true architectural delights. One of the more commonly found housing styles is the Italianate which must have been a favourite among London's builders. The term Italianate stems from the Italian villas, particularly those of Tuscany, that inspired the style. The villas were built for the Florentine elite during the Renaissance but English architects, searching for a new look, went for it in a big way in the 1800s. The fact that Queen Victoria's husband, Prince Albert, designed Osborne House in the Italian villa style helped popularize the look. It's a giant leap from Renaissance villas and royal palaces to the Italianate homes of London, Ontario. The square towers didn't appear here at all. 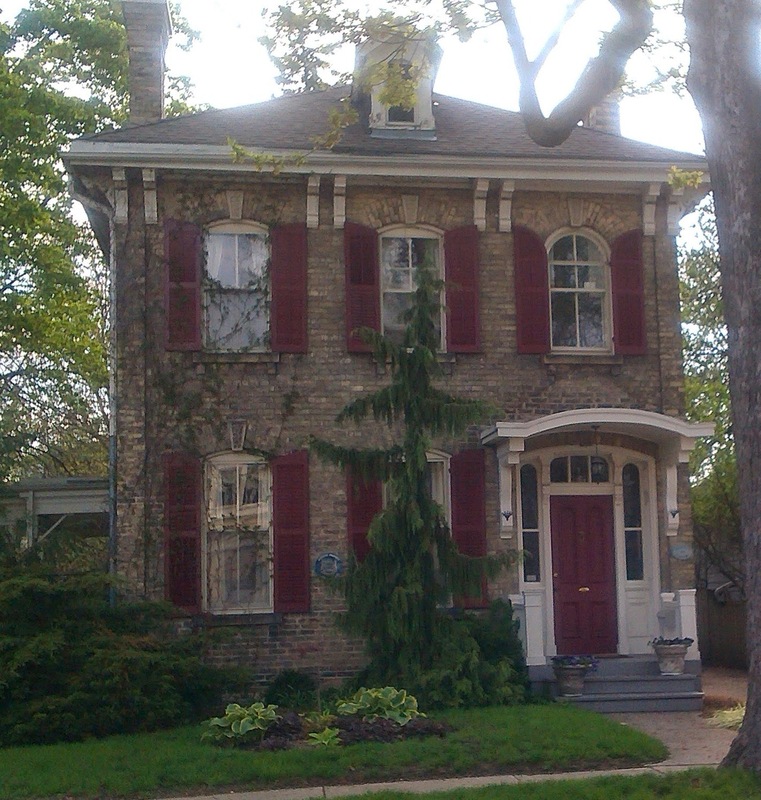 Nevertheless, an extremely scaled down version of Italianate become popular throughout the province from about 1860 to 1890 and London has numerous examples. 23 Peter Street, built about 1873, could be a textbook illustration of an Italianate house. The low-hipped roof, wide eaves, double brackets, and elongated windows are typical of the style. Bricks form segmental arches over the windows and doorway and there are brick pilaster strips at the corners of the building. A blue historic plaque has been placed on this house and a sign to the right of the door tells us this was once the home of Rowland Dennis, Ironmonger, in 1875. Mr. Dennis owned Forest City Wire Works, specializing in fencing, railings, crestings, finials, and stable fixtures. By 1895, his company had been renamed Dennis Wire & Iron Works. On the other hand, 505 Talbot, now dwarfed by the apartment building behind it, might be described as an Italianate mansion. Still the low-hipped roof, wide eaves (in this case with a frieze), large paired brackets, and elongated windows, but on a much grander scale with a two-storey central projection and nice trim above the second-storey windows. This one was built for James Owrey, a director of Agricultural Savings and Loan Co., about 1881. The brick has been painted and dormer windows added. 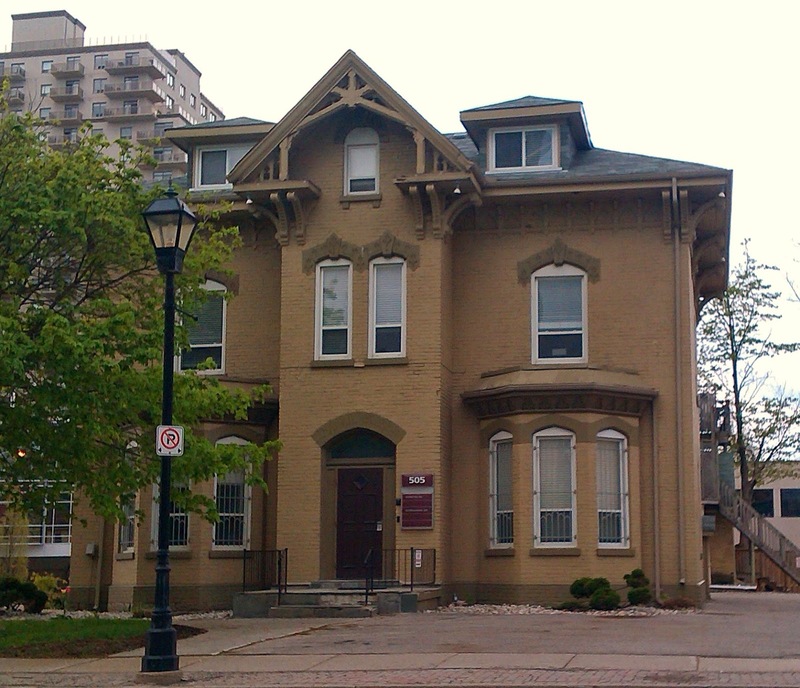 Houses such as this one indicate this stretch of Talbot Street must once have been a prestigious neighbourhood. Update, September 2015: Go look at 505 Talbot while there's still time. Sadly, even though it was listed as a Priority 1 on London's heritage inventory, this is one of the buildings scheduled for demolition ﻿by Tricar to make way for a 30-storey tower. 23 Peter Street is gorgeous. My problem is walking along some of London's beautiful residential streets and stopping to ooh and aah too much as my friends urge me to get a move on. Please tell me they changed their minds about demolishing 505 Talbot. From the picture it looks like such an amazing building. I don't personally like the decision to add the dormers or the painted masonry, but the bay-outs and gable detailing is just amazing. Unfortunately, the building has been demolished.